Kathy has enjoyed a long performance career in the San Francisco music scene. As a lead singer in one of the Bay Area’s most sought-after party bands, she has performed before thousands at corporate events around the world, opening for acts like Sheryl Crow, Donna Summer and Tony Bennett. As a back-up singer she has performed with Bonnie Raitt, Elvin Bishop, Ronnie Spector (The Ronettes), Eddie Money, Bill Spooner (The Tubes) and Al Jardine (The Beach Boys), and has also shared the stage with members of Santana, Tower of Power, Chris Isaak band and the Steve Miller Band. She also toured with Mickey Thomas’ Starship singing lead on Grace Slick’s “White Rabbit” and “Nothings Gonna Stop Us Now.” She brings 20 + years of real-world experience as a singer to her thriving teaching practice. Co-owner of The Voice Studio in San Francisco, Kathy began teaching voice, in addition to performing, in 1995. She started studying with Seth Riggs at this time, and by 2007 she was asked to join a small eight-person team of Master Teachers of his technique. 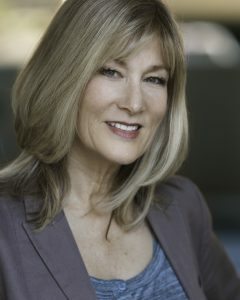 She has trained other voice teachers and taught public workshops in Europe, Asia and Canada, as well as in the U.S. Kathy has also taught at: Seth Riggs Summer Vocal Program in Los Angeles, The Blue Bear School of Music in San Francisco, The West Coast Songwriters Conference, Blue Star Music Camp, Rising Stars Boot Camp, and the Performing Arts and Medicine Coalition, San Francisco, CA. She greatly enjoys working with people of all ages and levels of development. As a teacher, Kathy has a wonderful ability to meet each student at their level, and tailors the lessons to what their particular vocal issues are to help them reach their desired goals. She can quickly analyze a voice and get it functioning better. Her students rave about her and how she has helped them develop the technical skills they need to feel confident about their voices. Whether you are a total beginner who just wants to sing for fun, or a seasoned pro, she can help you understand how your voice works and how to get the most out of it. Kathy has helped many singers who face challenges of live performance such as bad sound systems/ inability to hear oneself, and how to keep your voice intact through tough situations. Kathy has 20 + years of singing and teaching experience and a wealth of information and tips to help others singers deal with performance challenges, refine their technical skills, feel confident about their voices and develop their own style.